The Greater Oklahoma City Chamber recognizes the benefits of partnerships when working to represent the business community and create a pro-business climate statewide. In 2018, the Chamber will work together with the State Chamber to lobby the Legislature on the following issues. The Chambers support defending and improving the comprehensive workers’ compensation reform legislation passed by the Legislature and signed by Gov. Mary Fallin during the 2013 session. The Chambers support retaining the state’s premier economic/community development programs which are critical for attracting new businesses to the state, assisting the expansion of existing companies and encouraging investment in communities across the state. The Chambers support the Oklahoma Incentive Evaluation Commission, which was established to make recommendations to the Legislature and governor on which incentive programs are serving their intended purpose and creating economic/community development. The Chambers will oppose legislation that would allow guns to be carried on college campuses or limit a business owner’s rights to prohibit weapons. The Chambers support efforts to further criminal justice reform to improve workforce and protect public safety while decreasing costs within the state’s budget. The Chambers support legislation to strengthen the long-term financial condition of the state’s pension plans. The Chambers will work with the governor, state legislature, tribal partners and other stakeholders to ensure the availability of a long-term water supply. The Chambers support a stable oil and gas tax structure which promotes the investment of drilling capital in Oklahoma and tailored regulations based on business activity, use and risk. The Chambers support efforts to ensure a level playing field between community retailers and remote/internet sellers to ensure sales and use taxes from online purchases are accurately reported and collected. The Chambers support federal immigration reform to secure the borders and establish reasonable and effective visa policies/procedures to attract essential workers to the United States. The Chambers recognize the need to increase pre-K-12 teacher base pay. We want to see Oklahoma teacher pay to be competitive with the regional average. The Chambers support development of a long-term teacher pay plan that helps address the teacher shortage by rewarding teacher performance and experience or incentivizes teachers to work in high priority areas. The Chambers support early childhood education and full funding of pre-K and kindergarten programs and legislative initiatives to maintain early childhood education programs. Business leaders want education funding to focus on improving quality of instruction in the classroom. The Chambers support efforts to increase funding transparency that make it easier to understand per-pupil spending, so we can ensure that as much funding as possible goes directly to classroom activity. The Chambers also support fundamental administrative reforms that allow more money to go directly into classrooms and provide school districts with more flexibility to spend local funds. The Chambers support the revision of policies/laws to improve the recruitment and retention of high-quality teachers. This includes support of other alternative pathways that enhance the diversity and skill sets in the teaching profession. The Chambers support charter schools and education choices. Charter schools are public schools, with public school students and are required to adhere to Oklahoma statures and performance standards. We support creating high-quality charter schools and enabling successful charter schools to grow. The Chambers support creating a solution to ensure all public schools are funded equitably, and we support creating a solution to address the facility needs of Oklahoma charter schools. The Oklahoma School of Science and Mathematics (OSSM) has consistently ranked among the nation’s top public high schools. Over half of OSSM graduates stay in Oklahoma, and 85 percent are choosing STEM careers. The Chambers support adequate funding of the OSSM FY 2018 budget request. The Chambers recognize the excellent learning opportunities offered to high school students and believe we should be encouraging students to begin pursuit of a degree or certification while still in high school. We support fully concurrent enrollment and Advanced Placement for all high school seniors and support the expansion of these programs for high school juniors. Oklahoma’s Promise is one of the most successful college access programs in the nation. The Chambers oppose legislation that would diminish the program’s focus on college access. The Chambers support funding to assure training needs of new and existing industries are readily available. 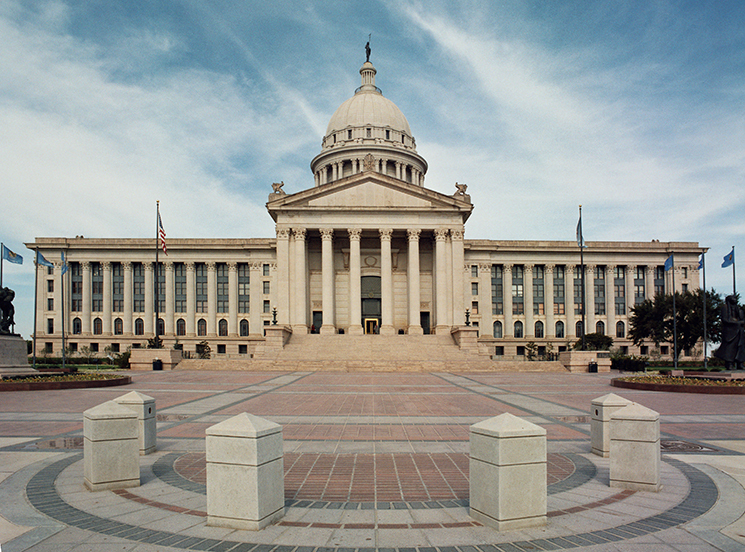 The Chambers support extending health insurance coverage to more Oklahoma residents through pursuit of all available funds, to cover the costs of uncompensated care that is currently shifted to employers and health care providers. The Chambers support the State of Oklahoma’s efforts to preserve the Insure Oklahoma premium assistance program designed to make health insurance more affordable for small businesses by broadening coverage to more of the state’s uninsured/underinsured. The Chamber’s support the funding source remains dedicated to Insure Oklahoma to preserve the program’s long-term stability. The Chambers support effective incentives and initiatives designed to enhance medical research and oppose efforts to unreasonably restrict the continued development of the state’s bioscience and research programs. The Chambers oppose new health insurance mandates and liabilities that will undermine an employer’s ability to provide quality health insurance at reasonable cost to employees. The Chambers further oppose new mandates being placed on physicians, hospitals and providers that will increase the cost of providing quality health care in Oklahoma. The Chambers support the following initiatives to address health care disparities: 1) incentivizing the recruitment and retention of primary care physicians, specialty physicians and other health professionals in rural and underserved areas; 2) expanding residency programs for the state’s medical schools and, 3) developing high school programs to encourage medical careers. The Chambers also support the appropriate expansion of technology platforms (such as telemedicine and telehealth) and data platforms to enhance access to health care for underserved Oklahomans. The Chambers support the constitutional provisions of TSET to support the public health of Oklahomans. The Chambers support adequate funding for the state’s uncompensated care pool to provide quality health care to underserved Oklahomans. The Chambers support efforts to improve the health of Oklahoma’s workforce. The Chambers acknowledge substance abuse is a crisis facing Oklahoma and support collaborative efforts by stakeholders to address this issue that can lead to death and negatively impact quality of life, health care costs and employers. The Chambers support market-driven health reforms as the best approach to reducing costs while promoting market stability, efficiency, wellness and quality of care. The Chambers continue to support a long-term solution to address full reimbursement funding for Medicaid services since erosion of funding shifts cost increases to businesses and other taxpayers. The Chambers support providing adequate annual appropriations to implement Gov. Fallin and the Oklahoma Department of Transportation’s (ODOT) Bridge Improvement Plan to repair or replace all of Oklahoma’s structurally deficient bridges on the state’s highway system by 2020 and further ensure that ODOT can maintain a nationally leading bridge improvement program. The Chambers support annual appropriations necessary to preserve and implement ODOT’s eight-year construction work plan. Further, the Chambers will strongly oppose any effort to divert dedicated transportation funding to other areas of government. To ensure funding is available to ODOT for the performance of critical project completion and maintenance work on the state’s transportation system, the Chambers support keeping the state’s gasoline tax revenue whole. The Chambers support increasing the state’s gasoline tax and diesel tax to the regional average and dedicating the increased revenues exclusively to transportation. The Chambers support Gov. Fallin and the Oklahoma Turnpike Authority’s “Driving Forward” Turnpike Program to modernize Oklahoma’s turnpike system. The Chambers support adequate annual state appropriations and staffing levels for the timely completion and effective use of weigh stations at Oklahoma’s ports of entry to ensure the protection of Oklahoma’s roads and bridges from unnecessary damage caused by overweight freight loads. The Chambers will work with our congressional delegation and ODOT to secure a permanent funding solution for the Federal Highway Trust Fund (including mass transit programs). The Chambers support adequate funding levels to properly maintain the national transportation system. The Chambers oppose any efforts by the Surface Transportation Board (STB) to impose additional regulation on freight rail operators.